What's a Mexican's favourite matched betting lay method? ..underlay, underlay! What is Underlaying and Overlaying? 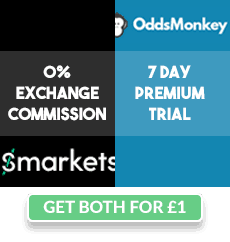 They are lay bet techniques, designed to vary your profit depending on the outcome of your bet. Allowing you to turn those offers that are not risk-free into risk-free offers (explained later on). Underlaying a particular bet means that if that bet were to win on the bookmakers then you will end up with more profit and vice versa, if it were to lose on the bookmakers, you will end up with less profit than if you were to lay the bet normally as per the calculator. Overlaying is then the opposite of underlaying and results in less profit if the bookmaker bet wins, but more profit if the bookmaker bet loses. If you're placing a trigger bet on a refund offer, i.e if you want a team/horse to lose in order to trigger the free bet. These offers would otherwise come with a risk of not triggering the free bet and still occurring a trigger bet aka not risk-free. Underlaying, which you may guess from the name means you lay less than the amount you would if you wanted equal profit. Laying less means that we will lose less if our exchange bet loses (bookmaker bet wins), but then it also means we win less if our lay bet wins (back bet loses). To calculate underlays using the matched betting calculator you first need to switch to 'advanced mode' in the top right box. Offer: Money back as a free bet (up to £10) if your horse loses. The issue with this kind of offer is that if we back the winning horse we don't get the £10 free bet, however we still incur the trigger bet loss when placing the trigger bet. Meaning we risk losing money. 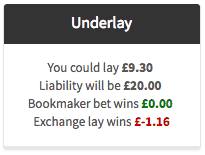 Underlay solution: lay slightly less than needed, meaning you win slightly more on the exchange if the bookmaker bet wins. If we choose to pick a horse with back odds of 3.0 and lay odds of 3.15 (as in the above screenshot), then we see we lose 80p if the horse wins using the normal lay method. However losing on the bookmaker means we trigger the £10 free bet - happy days! If you're placing a trigger bet and you want a team/horse to win in order to trigger the free bet. Again, these offers come with the risk of not triggering the free bet and still occurring a trigger bet aka not risk-free. Overlaying is, you guessed it, laying more than you usually would. To accommodate for the fact we could lose the back bet and therefore lose the trigger bet loss and get no free bets. Laying more means that we will lose more if our exchange bet loses (bookmaker bet wins), but then it also means we win less if our back bet wins (lay bet loses). Which is fine as we'll be using it for offers that reward us with free bets if our back bet wins! 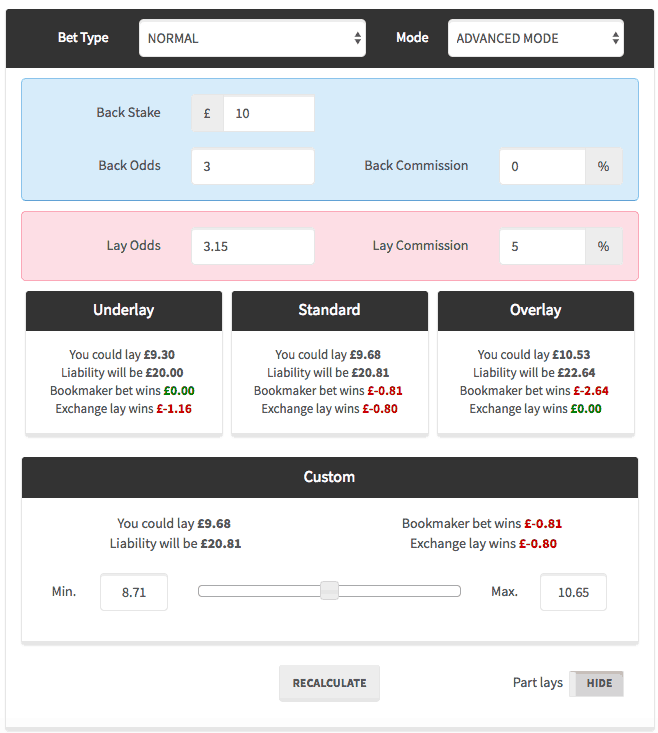 As with underlays, to calculate overlays using the matched betting calculator you first need to switch to 'advanced mode' in the top right box. Use the slider in the 'custom' section of the calculator to tweak the lay amounts to your content. Depending on how much profit you want to lock in. Offer: Your stake as a free bet (up to £10) if your horse wins. The issue with this kind of offer is that if our horse doesn't win then we don't get the £10 free bet, however we still incur the trigger bet loss when placing the trigger bet. Meaning we risk losing money. 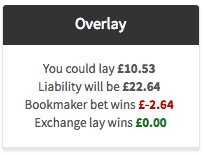 Overlay solution: lay slightly less than needed, meaning you win slightly more on the exchange if the bookmaker bet wins. As before, if we choose to pick a horse with back odds of 3.0 and lay odds of 3.15 (as in the above screenshot), then we see we lose 80p if the horse loses using the normal lay method. However winning on the bookmaker means we trigger the £10 free bet - happy days!